Onkyo brings direct 'in-app' access to Spotify on Android | What Hi-Fi? More Spotify news, this time from Onkyo: it's released a firmware update that enables direct support for Spotify Premium through Onkyo's remote app for Android. The Android app itself has also been updated. "Enabling direct support for Spotify via our remote app for Android represents a major step forward when it comes to ease of use and convenience for our consumers," says Nick Hamada, Onkyo Europe's product and marketing manager. Onkyo home cinema receivers compatible with the upgraded app are as follows: TX-NR609, TX-NR709, TX-NR809, TX-NR1009, TX-NR3009, TX-NR5009, and PR-SC5509. More models will be made compatible with the upgrade towards the end of November, including the TX-NR509 network receiver, the HT-S6405 and HT-S940THX AV receiver/speaker packages and the TX-8050 network stereo receiver. 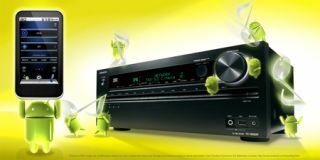 At the same time Onkyo will also issue a firmware upgrade to allow owners of all its network products with Spotify support to access the music streaming service using their Facebook account details.